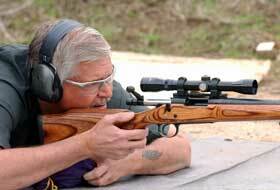 Definition of DROPPED SHOT: In the practical shooting sports, a shot that fails to hit the target; a miss. 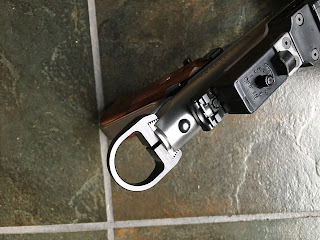 Sometime in mid-1985 I first wrote those words for the first time, for the newly minted FRONT SIGHT Magazine, the journal of the United States Practical Shooting Association. I was the founding editor, and DROPPED SHOT was my back page column. If you’re willing to wade deep enough into the bowels of the Internet, you can find a picture of my competition rig for that year…it’s the cover of the November/December 1985 FRONT SIGHT. It’s a Wilson Combat, and I still have it. Over the years, DROPPED SHOT has drifted around from publication to publication and finally to the Internet, as soon as Marshal Halloway invented the concept of a “social media” site for gun owners and shooters somewhere around 1991. I bring this up because I suppose DROPPED SHOT has a life of its own now, and, like my original Vampire Gun™, has come back to life! How's that for a segue! This is for an upcoming SHOOTING GALLERY ONLINE (SOG)...it's my original "Vampire Gun," built by Tactical Solutions way before we started the RIMFIRE CHALLENGE. 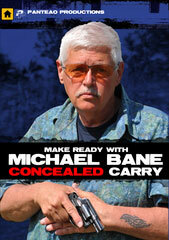 It was a Ruger 22/45 back before Ruger offered them with replaceable 1911-style grip panels. 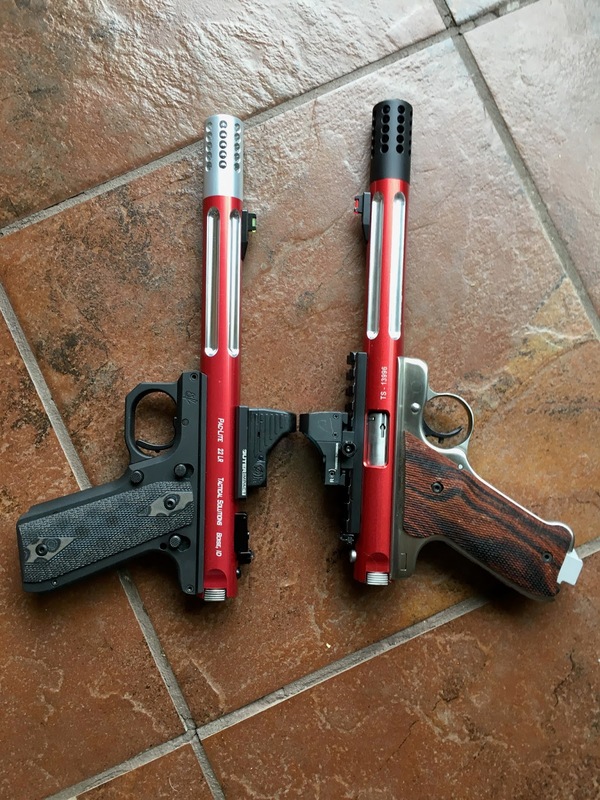 The top end was one of TacSol's early 6-inch Pac-Lite barrels. Interestingly enough, the barrel wasn't threaded, because the suppressor "revolution" hadn't started yet. 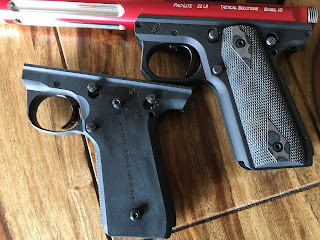 I shot the gun a LOT (and you've seen it on multiple episodes of SHOOTING GALLERY over the last decade or so), bust as I've built up, or, more correctly, had built up, .22 rimfire pistols, the Vampire Gun got relegated to the back of the gun safe. I was talking to my good friend Colt Lasco, who's one of the gunsmith geniuses at TacSol, and I mentioned that I still had Vampire #1. Colt said, "Hey, why don't we take the old gun and bring it up to speed?" Seemed like a good idea! So, this is Vampire #1 brought up to speed...the barrel is now a threaded version. 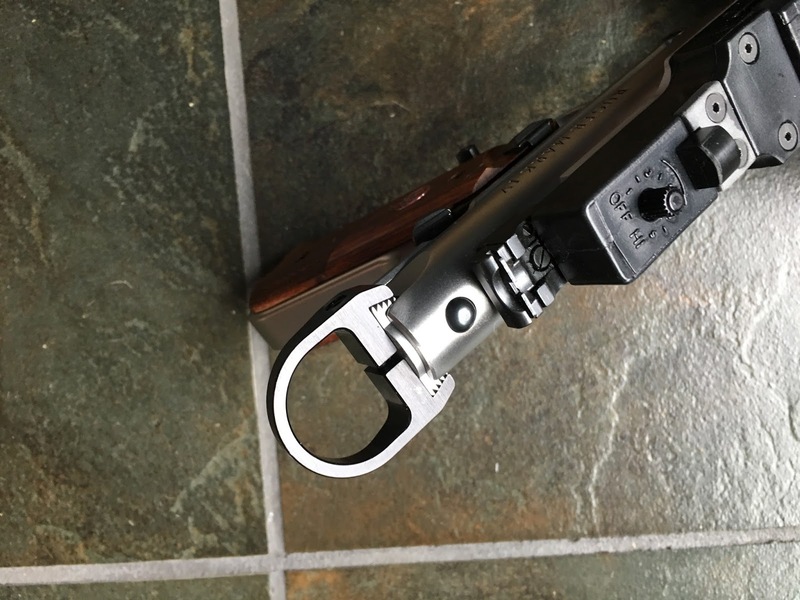 The TacSol brake on the end of that barrel looks cool and makes noise; it may even actually step a little recoil, but who knows with the tiny .22LR. It's funny that when I'm at home, I want the gun quiet; when I go to a match, I want the gun loud, for the time. 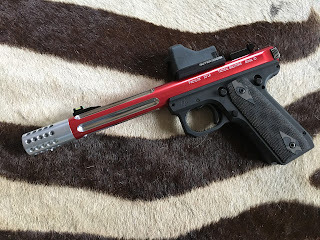 At a recent rimfire match where I was shooting my Ruger Mark IV, which does not have a threaded barrel, and Gemtech .22 subsonic (which do run that gun), I had to timing strings of 30 seconds each, max time, as opposed to the sub 3-second runs I thought I had had. Quiet not good, LOL! 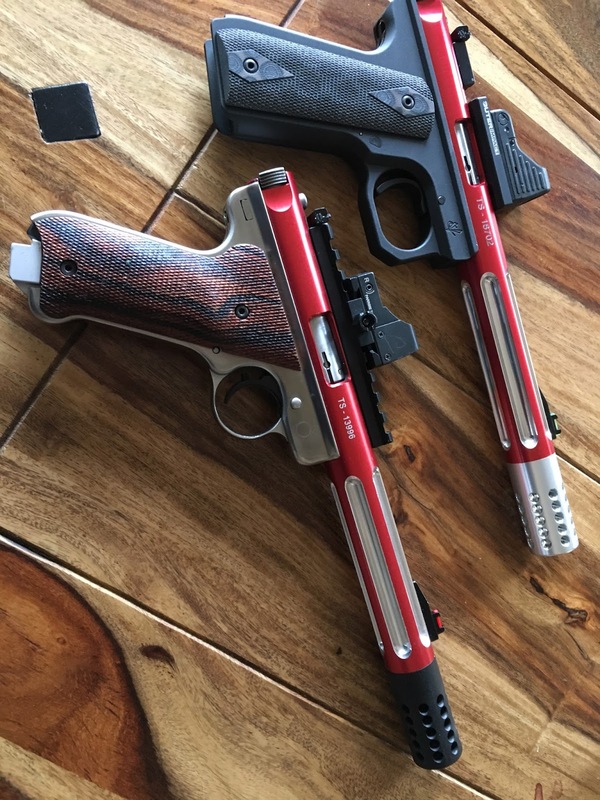 Vampire #1 now sports an Outer Impact red dot mount, which brings the old — and excellent — Insight MRDS down a wee bit closer to the bore line than the Primary Arms dot on Vampire #2, the TacSol I built on a Ruger MkIII that has been my go-to RIMFIRE CHALLENGE match gun for several years. The Insight MRDS is still available, and I believe is the same unit as the Eotech MRDS. 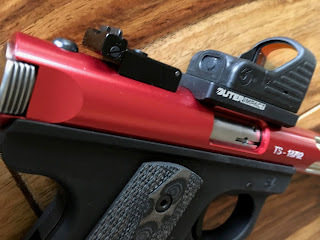 The biggest change to Vampire #1 was replacing the polymer Ruger frame with an aluminum frame and match trigger from Volquartsen. These are excellent,, and I love the way the frame now sits in my hand. The new gun weights in at 1.78 pounds, vs. 2.01 pounds for my Mark III/TacSol competition gun and 2.95 for my all-steel Mark IV...that weight includes sights and mounts, but not magazines, BTE. The grips are from Hogue. One thing left to add is a Teandemkross Halo charging ring like I have on my Mark IV. I've used a bunch of different charging handles over the years, and the Halo is the only one that stays put.